Lee Elmer Handley (July 13, 1913 – April 8, 1970) was an American professional baseball second baseman and third baseman. He played in Major League Baseball (MLB) from 1936 to 1947 for the Cincinnati Reds, Pittsburgh Pirates, and Philadelphia Phillies. His younger brother, Gene, also played in the Major Leagues from 1946 to 1947. Listed at 5 ft 7 in (1.70 m), 160 lb., Handley was a flashy infielder and a disciplined hitter as well. He reached the majors in 1936 with the Cincinnati Reds, spending one year with them before moving to the Pittsburgh Pirates (1937–41, 1944–46) and Philadelphia Phillies (1947). 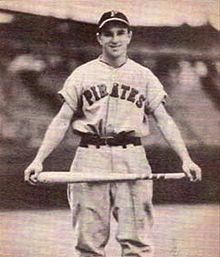 He was a rookie Pirate regular at second base in 1937, and a full- or part-time third baseman from 1938 through 1941. His most productive season came in 1938, when he posted career-numbers in games played (139), runs (91), hits (153), doubles (25), home runs (6) and runs batted in (51). He also was considered in the Most Valuable Player vote. In 1939 Handley hit a career-high average of .285 and tied for the National League lead in stolen bases (17), despite suffering a serious beaning that kept him out of the lineup for 52 games. He also was hurt in an automobile accident before the 1942 season, but returned in 1945 to hit .298 in 98 games. In a 10-season career, Handley was a .269 hitter with 15 home runs and 297 RBI in 968 games, including a solid 1.31 walk-to-strikeout ratio (267-to-204). An alumnus of Bradley University, Handley died of an apparent heart attack in Pittsburgh, Pennsylvania, at the age of 56. This page was last edited on 29 July 2018, at 04:38 (UTC).